NOTIFICATION: Government of Jharkhand, Urban Development and Housing Department (UDHD), Ranchi (Jharkhand State) inviting online applications for filling up 141 vacant posts of Junior Engineer in Civil, Electrical and Mechanical Discipline on contractual basis for providing services in various Urban Local bodies under Urban Development & Housing Department, Jharkhand from eligible and interested willing candidates. It is latest & good information for unemployed personnel those who are looking for these new Jobs in Government sector & other organizations. Job seekers, who wish to apply for these vacancies regarding Jharkhand UDHD Recruitment 2018, must have passed Diploma in Civil / Electrical / Mechanical Engineering discipline from Government Polytechnic Institute of Jharkhand with computer knowledge. Applicant’s upper age should be as per Govt. rules and age relaxation is applicable to all reserved category candidates i.e.SC/ST/OBC/PWH /Ex Servicemen/Women candidates etc. 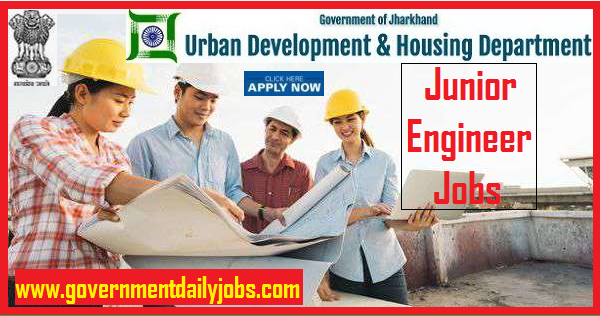 NO OF POSTS: 141 vacant posts of Junior Engineer in Civil, Electrical and Mechanical Discipline on contractual basis in Jharkhand, Urban Development and Housing Department (UDHD), Ranchi. 1. Junior Engineer, Civil: 93 posts. 2. Junior Engineer, Electrical: 23 posts. 3. Junior Engineer, Mechanical: 25 posts. EDUCATIONAL QUALIFICATION: A passed of Diploma in Civil / Electrical / Mechanical Engineering from any Government Polytechnic Institute, Jharkhand or an Institute approved by Government of Jharkhand & A.I.C.T.E OR a candidate should be Graduate in Civil / Electrical / Mechanical Engineering from an Engineering College approved by Government of Jharkhand & A.I.C.T.E. OR a candidate should be resident of Jharkhand and have Diploma/ Engineering degree in Civil / Electrical / Mechanical branch from an Institute/ Engineering College approved by A.I.C.T.E. AGE LIMIT: Candidate’s required age should be in between of 18 years to 35 years as on 01-08-2017 for UDHD Jharkhand Recruitment 2018 Apply Online 141 Junior Engineer Jobs. AGE RELAXATION: As per Govt. rules age relaxation is applicable for said post to all reserved category candidates. PAY SCALE: ₹ 28,755 – ₹ 30,000/- per month. Name of the Bank: Union Bank of India. Branch Name & Address: Argora, Vasundhara Megamart, Argora Bypass Road, Argora, Doranda, Ranchi-834002. Account Holder Name: M/S GENERAL MANAGER JUIDCO LTD.
No fee from SC/ ST/ PH/ Women category candidates. POST RESERVATION: All reserved category candidates ie. SC/ ST/ OBC/ PWD/ Women/Ex Servicemen/Widows etc (as applicable) are being selected for said post/s as per existing Govt. policy/rules. बिहार विधान सभा सचिवालय ने 166 Driver, Library Attendant, Order Paper Distributor, Office Attendant, Office Attendant (Darban), Office Attendant (Farrash), Office Attendant (Sweeper) & Office Attendant (Gardener) की भर्ती के लिए अधिघोषणा जारी की है। इच्छुक उम्मीदवार यहाँ आवेदन कर सकते हैं। आवेदन करने से पहले पूर्ण अधिसूचना यहाँ पढ़ें । 166 group D vacant posts of Driver, Library Attendant, Order Paper Distributor, Office Attendant, Office Attendant (Darban), Office Attendant (Farrash), Office Attendant (Sweeper) & Office Attendant (Gardener) male & female in Bihar Vidhan Sabha Sachivalaya, Patna. LAST DATE TO APPLY: 22-11-2018. SELECTION PROCESS: Applicants who are screened for applicability /eligibility are being selected as per organization policy/rules depending on the basis of their performance in Written Examination and Personality Test. NOTE: After preliminary scrutiny, the shortlisted applicants shall be called for written examination by State Board of Technical Education (SBTE)/Technical University. Date, time and venue for the test will be intimated by the Directorate of Municipal Administration. 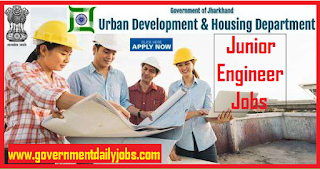 HOW TO APPLY: For said posts (UDHD Jharkhand Recruitment 2018 Apply Online 141 Junior Engineer Jobs) eligible, willing and interested candidates may apply through online/offline at official website mode up to last date. Applicants must retain a hard copy for future reference. NOTE: For those candidates who have already applied either through online or offline mode, it is mandatory for them to apply again by visiting the above mentioned link/website. However, no application fee will be required for those candidates but they will have to update their payment/ transaction details, failing which their candidature will be cancelled. 2. Search for UDHD Jharkhand JE Recruitment 2018 Notification Link. 3. Download the Jharkhand Urban Development Junior Engineer Notification. 5. Eligible candidates can click on Apply Online Link. 6. Download the UDHD Jharkhand Online Application Form for offline. 7. Fill in the Jharkhand UDHD Application Form online. 8. Make the Payment of Application Fee. 9. Cross check the entered details. 10. Submit the UDHD Jharkhand JE Online form and take a printout of it for future reference. CONTACT ADDRESS: Jharkhand, Urban Development and Housing Department (UDHD), 4th Floor, Project Bhawan, Dhurwa, Ranchi- 834004/ Phone: 0651 244 6640. CONCLUSION: Jharkhand, Urban Development and Housing Department (UDHD), Ranchi invites online application for the recruitment of 141 vacant posts of Junior Engineer in Civil, Electrical and Mechanical Discipline on contractual basis from Indian residents who are eligible & interested; candidates can apply through online application. Candidates can download detailed advertisement /notification from official website for recruitment information like required age, reservation in age, required education qualification, required application fee, reservation for posts, syllabus, date of test, last date to apply, number of vacant posts, name of department, mode of selection, how to apply and other instructions. LAST DATE TO APPLY: 05-11-2018 for UDHD Jharkhand JE Recruitment 2018 | 141 Jr Engineer Posts.